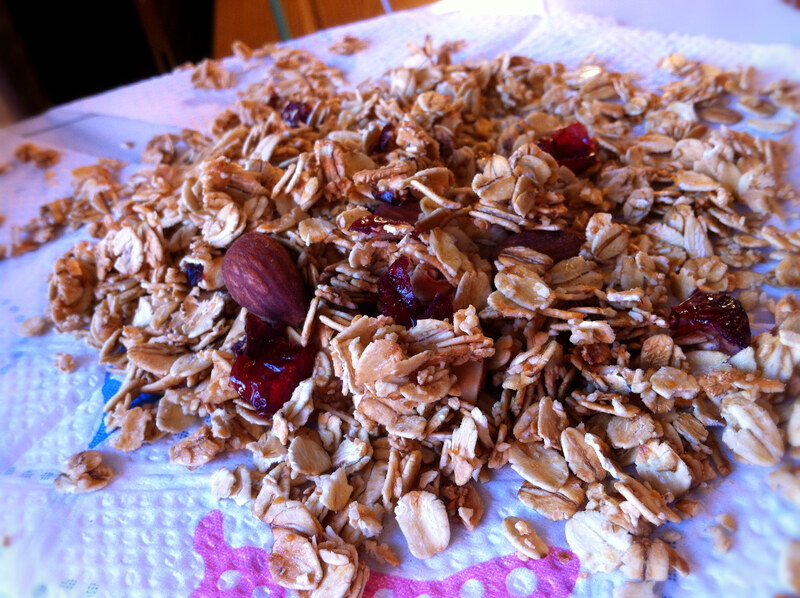 Crunchy granola in less than 5 minutes. No ovens involved. It’s pretty darn healthy too—none of that brown evaporated cane syrup rice juice business. I’ve actually been making it in my dorm room for quite some time, although I’m not entirely sure if my roommate approves of our room consistently smelling like warm granola. On an unrelated note, I’ve figured out that if you give people enough food, they lose their ability to complain/protest/talk. I must warn you, however, that granola can and will get burned in the microwave. I’m just glad I haven’t set off the building’s fire alarms yet, because I’m not sure how I could explain making granola using a microwave at 11:30pm on a Saturday night in my bright blue Hello Kitty pajama shorts. With a spoonful of Nutella in one hand and a Harry Potter movie in the other.